Large Format Printing in Toronto is a fantastic way for everyone or any organization to help ensure that their content is going to be noticed. Today, there is a huge demand for printing in large format as they continuously boost up advertising campaigns. In the online printing industry, this format is used extensively owing to the fact that high-quality printing is made available at affordable rates. This type is one of the most effective means of marketing your products and services through meaningful images and messages. It is an excellent option to obtain large photographic-quality images, courtroom graphics, tradeshow banners and graphics, outdoor banner display, presentations, research posters for medical and scientific presentations, promotional signage and more. 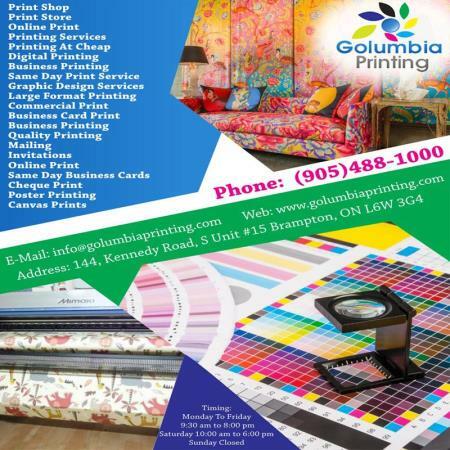 At Golumbia Printing in Mississauga, Toronto we offer a coherent approach and seamless service in large format printing that suits your need and expectation. Our professionals can handle simple to complex orders with ease with minimum turnaround times and get printing at cheap rates. Refer to our website for more information.